At 6' long and bearing the black body and distinctive red hourglass markings of the giant black widow, this spider can - at a glance - be mistaken for that deadly creature. 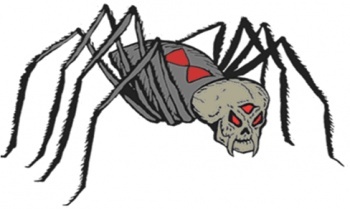 However, the death's head spider possesses an unmistakable feature: a grayish skull with fang-like pincers and a trio of glowing red eyes that radiate a magical aura of terror (see below). Solitary creatures, death's head spiders are notoriously aggressive and will attack anything they don't view as a threat - including others of their own species, to whose venom and aura of terror they are immune. At the start of each round, any creature approaching the spider from the front must save vs. Spells or be paralyzed with fear for 1-8 rounds. (Creatures that are normally immune to magical fear are not affected by the spider's aura. Dispel magic cast on a paralyzed victim will remove the paralysis.) The bite of a death's head spider has the same effect as that of a giant black widow. It is almost certain that death's head spiders are the result of magical manipulation of existing giant black widows. In fact, a recently discovered grimoire - purported to have been brought back by a bold expedition into The Blighted Lands - is alleged to have been authored by one of Califrax's cabal of wizardly underlings, and is rumored to contain the rituals used to create the spiders. Unfortunately, said grimoire disappeared shortly after the expedition's return to the east, and its current whereabouts is unknown.